The Diplomatic Community in Abuja has congratulated the United Nations System in Nigeria for its return to the UN House seven years after the insurgent group, Boko Haram, wreaked havoc on it. The Diplomats’ commendation was contained in a goodwill message delivered during the 73rd Anniversary of United Nations Day, a release from the Liberian Embassy in Abuja writes. According to the release, Liberia’s Ambassador to Nigeria, His Excellency Professor Al-Hassan Conteh read the goodwill message on behalf of the Dean of the Diplomatic Corps in Nigeria, and the High Commissioner of Cameroon, His Excellency Mr. Abbas Ibrahima Salaheddine. This year’s UN Day celebration held at the Forecourt of the UN House in Abuja on October 24, 2018. 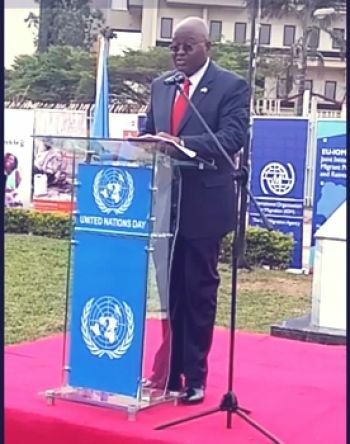 “We like to congratulate you on your return to this building and we pray to the Almighty God for your protection, peace and solidarity as you resume your important work here”, the release quotes the Diplomatic Community as saying in its UN Day goodwill message. According to the release, the UN Resident Coordinator, Edward Kallon disclosed that the UN family has started phased-movement back to the UN House in Abuja, seven years and almost two months after the building suffered a car bomb explosion on Friday, August 26, 2011. The attack left at least 21 killed and 60 others wounded. At the same time, the Diplomatic Corps in Nigeria says it is time for Africa to be represented as a full member of the United Nations Security Council. The Diplomats asserted that this will help in strengthening global partnership for the acceleration of progress for growth and development if there must be “an inclusive United Nations”. The Diplomatic Corps also stated that “today’s durable international peace and security, which are the catalysts for growth and development”, cannot be achieved without the United Nations. They however acknowledged that the attainment of economic growth and development remain challenges in many parts of the world today despite the UN’s commendable strides. Earlier, the UN Resident Coordinator, Mr. Edward Kallon asserted that the 2018 UN Day was a very important day for the UN system in Nigeria as it underscores the excellent cooperation and partnership of the UN and Nigeria over the years. “Indeed this year’s UN Day also marks the UN family’s partial move back to the UN House”, the release quotes Mr. Kallon. According to him, the UN House is a symbol of resilience to the UN family and the extraordinary cooperation and partnership with the government and people of Nigeria. Also congratulating the UN family on the return to the edifice was the Federal Capital Territory Minister, Mohammed Bello. Represented by Mr Umar Jubril, an official of the ministry, Mr. Bello assured the UN of the FCT’s commitment to the security of the lives and property of all staff, their families and the institution. He then added that the reopening represented not just the fulfillment of efforts to rebuild the UN Building, but make it better. “The UN Building stands out as the symbol of our resilience and unbroken promises in addressing various challenges we are facing as a nation”. Until the unfortunate terrorist attack of August 26, 2011, the UN House accommodated all UN agencies in the Central Business District of Nigeria’s Federal Capital, Abuja, the release concludes.